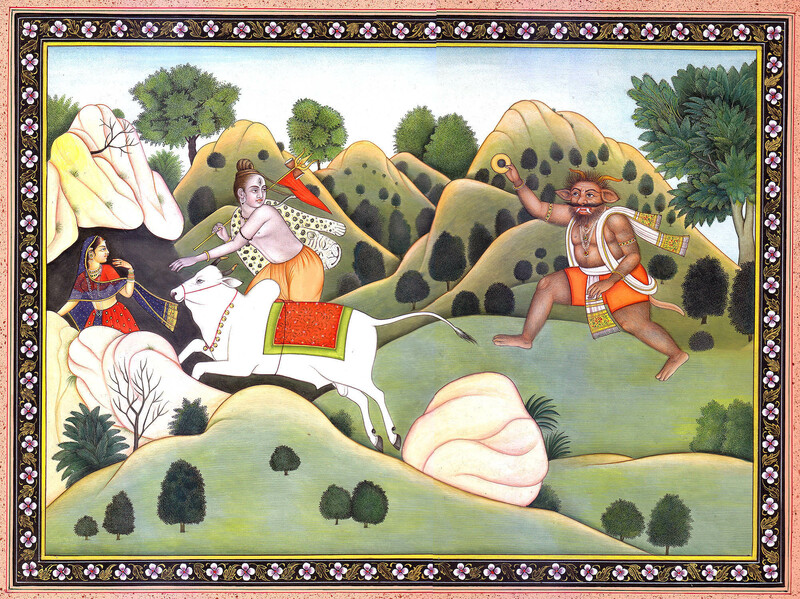 The painting, an excellent work of art rendered using late eighteenth century idiom of Pahari art as it prevailed at Kangra, the same kind of terrain comprising green pastoral hills, low and high, pinkish rocks and deep green blackish trees and shrubs scattered all over, delicate figures of Shiva and Parvati with fine features, and extra white figure of Nandi, illustrates the legend, perhaps the only one of the kind in entire Shaivite mythology, in which Shiva along with Parvati, his consort, and his mount Nandi is forced to flee for life. So deep is agony that Shiva forgets to ride his mount and runs along it on foot. With dismay and feigned awe effectively portrayed on Shiva’s face, concern-mixed astonishment on the face of Parvati, instinctive fear in the behaviour of Nandi and the notorious smile on the face and in the demeanour of the demon the canvas most powerfully stages its drama particularly when the viewing mind knows that Shiva is supreme beyond anyone’s power to harm him and what views the eye is mere fiction. Vraka-related legend occurs primarily in the Bhagavata Purana though a few other texts also allude to it. In late Marathi mythological literature there appears an identical legend with Bhasmasura as its principal demonic character. Bhasmasura is now a commonplace used for a person who by his ill deeds turns into ashes his own as well as anyone’s reputation he comes into contact with. In recent row over the creation of Lokpal, those not in favour of vesting all powers into Lokpal without safeguards fear that Lokpal, with his absolute authority and arrogance born of his absolute powers might turn into a Bhasmasura and might destroy even that democratic system that created it. 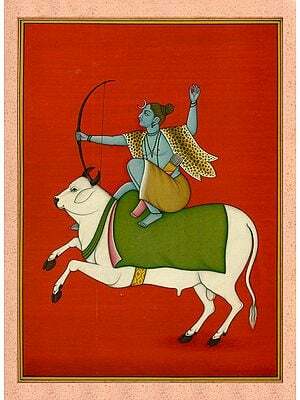 As is the mythological position, Vrakasura, a demon in the line of Hiranyakasipu, was the son of demon Shakuni. Like Hiranyakasipu he too was highly ambitious and wished to rule the world by obtaining rare divine powers, which he could do by propitiating any of the gods from the great Trinity, but who among them he was not able to decide. Ultimately he met sage Narada who advised him to worship Shiva, who being the simplest, could be easily propitiated. Accepting his advice Vrakasura devoted to rigorous penance completely dedicating himself to Shiva. He would everyday cut one of his organs and offer it to Shiva by blazing it into the ‘yajna’ fire. Ultimately came the day when his head alone was left for making offering. The moment he inclined to cut it Shiva appeared and forbade him from doing so. Pleased by his great sacrifice and deep devotion Shiva asked Vrakasura for his wish. Vraka prayed him to grant him a boon which empowered him to turn into ashes any one, god, man, animal or other, whose head he touched. Shiva granted the boon. So empowered by Shiva’s boon Vrakasura thought he should test it on Shiva himself. Knowing his mind Shiva was left with no option but flee for life along his family. It is this moment of the myth that the painting portrays. In Marathi literature, except the demon’s name which is Bhasmasura, the myth is identical. ‘Bhasmasura’ might be a linguistic variation or corrupt form of ‘Vrakasura’. Later part of the myth has three minor variations. When chasing Shiva, Vrakasura met a boy who was Vishnu in transform. The boy laughed at him when told about Shiva’s boon. He ridiculed Shiva’s power to grant any such boon and asked him to touch his own head and find that it was all false. The demon did it and was turned into ashes. In some texts, though his role is the same, Vishnu appears as a Yogini. In Bhasmasura version his appearance is as Mohini. As Mohini he allures the demon to dance and, as one of its steps, to place his hand on his head and get burnt.